The heat of the campaign induces Trump and Clinton supporters to take sides. WASHINGTON—After the June 12 shooting in Orlando, Florida, in a gay nightclub killing 49 people and wounding 53, one would expect that attitudes towards Muslims and the Islamic religion would harden or, at best, not improve any. The attack by 29-year-old Omar Mateen, was the deadliest attack in the United States since 9/11 in 2001. The shooter during the attack called 9-1-1 to announce his sworn allegiance to the leader of the Islamic State, Abu Bakr al-Baghdadi. Survey data gleaned from large probability samples, reached by mail and telephone, show a stunning result. Americans on a whole became more favorable towards Muslims and even towards the religion Islam shortly after the Orlando shooting, not less as one would expect. In fact, this trend had been progressing since last November. 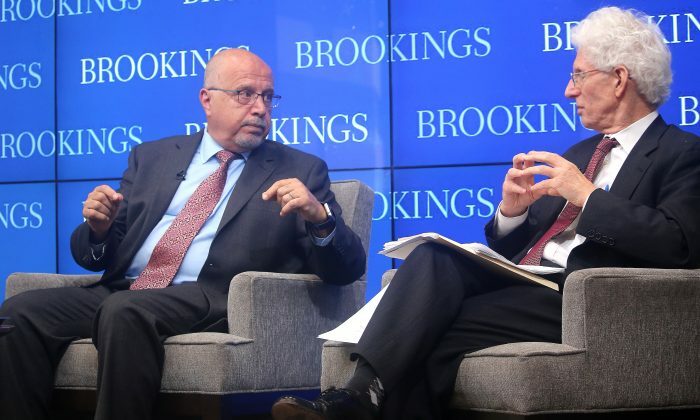 Brookings nonresident Senior Fellow Shibley Telhami summarized the findings of three public opinion surveys on American attitudes towards Muslims and the Muslim religion, on July 11, at the Brookings Institution. Two of the three surveys were planned ahead of time: November 2015 and May 2016. After the Orlando shootings, Telhami saw a good opportunity to conduct a third survey, about two weeks after Orlando (June 24-June 30) to measure possible shift in attitudes. Brookings partnered with the Sadat Chair for Peace and Development at the University of Maryland to sponsor the three surveys. The May survey consisted of 855 respondents with a margin of error or 3.4 percent. The June survey had 1,312 respondents with a margin of error of 2.7 percent. The key finding is that the percent favorable towards Muslim people was 53 percent in November, 58 percent in May, and 62 percent in June, following the Orlando shooting. The percentage unfavorable showed the reverse trend: 46, 41, and 38 percent, respectively. The Orlando shootings came six months after the terrorist attack in San Bernardino, Calif., where the two perpetrators swore allegiance to ISIS. That terrorist attack occurred in December after the November survey. Americans tend to be more favorable toward Muslim people compared to the Muslim religion, but even there, the same trend can be discerned. Percentages of favorable attitudes towards the religion progressed 37, 42, 44, and the unfavorable percentages decreased in a reversed pattern. It is well to remember that even though favorability toward the religion has improved, the unfavorable numbers are substantially bigger than the favorable. The November survey found 37 percent favorable versus 61 percent unfavorable. In the June survey, it is still 11 points bigger: 44 percent favorable versus 55 percent unfavorable. Another question asked about whether the respondent identified with the statement, “most people in the West and the Islamic world have similar needs and wants, so it is possible to find common ground.” Again the percentages in agreement increase for Nov., May, and June, which were, respectively, 57, 61, and 64. This result lends more support that the above described trend was not a statistical fluke. So, despite the “horrific mass violence perpetrated on American soil in the name of Islam” and an “American presidential campaign noted for its inflammatory rhetoric about Islam and Muslims,” Telhami writes in Politico, American public attitudes became progressively more favorable. “Overall, the trend is obviously more favorable than what one might have expected,” Telhami said. However, this result may have more to do with contemporary politics than an enduring change in attitudes towards Muslims and the Muslim religion. Telhami suggests that the results may be explained in part by the stances of the presumed presidential nominees, Donald Trump and Hillary Clinton, and their supporters wishing to be in alignment, or in opposition, to the candidates. Those who oppose [Trump] have the tendency to reject his view in part because it’s his…. It’s less about Islam and Muslims, and more about taking political sides. Breaking down the results by party affiliation reveals that Republicans and Democrats differed a lot in their attitudes towards Muslims and the Muslim religion. Consider the American attitudes on the Muslim religion, for example, which for the Nov., May, and June surveys were reported above as 37, 42, and 44 percent favorable—all numbers below 50 percent. Republicans showed no statistically significant difference in the three surveys—virtually the same over the seven months at about 24 percent favorable towards Muslims. Republicans did not contribute to the overall change in attitude from 37 to 44 percent between November and June. All the change can be attributed to the Democrats and Independents. The majority of Democrats are favorable, and their favorability was 51, 59, and 64 percent for the Nov., May, and June surveys—a 13 percent spread! Independents are a much smaller group than either of the major political parties; their ratings fell between Republicans and Democrats with 28, 34, and 38 percent favorable—a 10 percent spread. Unfavorable attitudes show the same pattern in reverse. The polarization on this issue increases dramatically between supporters of the party presidential presumed nominees. Clinton supporters were unfavorable towards the Muslim religion at 37 percent (May) and 33 percent (June). Trump supporters were unfavorable at 81 (May) and 84 percent (June). “So, it’s a huge polarization on this issue,” said Telhami. Indeed, the June survey shows a 51 percent difference between Republicans and Democrats on holding an unfavorable attitude towards the Muslim religion. Senior fellow at Brookings Institution William Galston noted the immense gap between Trump and Clinton supporters on their favorability towards the Muslim religion. In the June survey, 16 percent of Trump supporters were favorable compared to 66 percent amongst Clinton supporters—a whopping 50 percent difference. “So all of this suggests that the election we are actually going to have represents a greater degree of polarization between the two candidates and their supporters … than even between the political parties that they represent. So it is polarization on steroids,” Galston said. Telhami agreed and offered that the extreme differences we are seeing can partly be attributed to the “heat of a political season.” He said that GOP candidates link Islam and terrorism, especially Donald Trump, who regards Muslims as the problem. His supporters embraced his hardened view towards Muslims. Americans have developed a more nuanced understanding of the issue that’s been before them for a decade and half that not even the two recent terrorist events can change. Telhami stops short of attributing politics as the sole source for the shift in attitudes. He said that there has also been a demographic shift that has been evolving long before the Nov. survey. He notes that nonwhites are more sympathetic to Muslims than whites. “Young people are less critical of Muslims than older people.” And Americans who have a more global cosmopolitan perspective—for example, speak more than one language, have relatives outside the country, have passports, use the internet frequently, interact with non-Americans in social media—tend to hold more favorable views of Islam and Muslims. These trends are having an effect on attitudes towards Muslims and the religion. Americans have developed a more nuanced understanding of the issue that’s been before them for a decade and half that not even the two recent terrorist events can change, he said. African Americans as a group are by far the most sympathetic to Muslims in the entire U.S. population. An interesting finding in the data was highlighted by Galston, who observed that “African Americans as a group are by far the most sympathetic to Muslims in the entire U.S. population.” For whites, 35 percent are favorable towards the Muslim religion compared to 64 percent of African Americans, almost a 30 percent gap. Latinos lie in between with 51 percent favorable. Survey respondents were asked about “the most important factor that might have contributed to the Orlando shooter.” Overall, 33 percent of Americans said “radical Islamic ideology was at least contributing to Mateen’s overall motive for acting,” said Galston. Drilling down to subgroups, 40 percent of whites agreed compared to only 3 percent of African Americans.